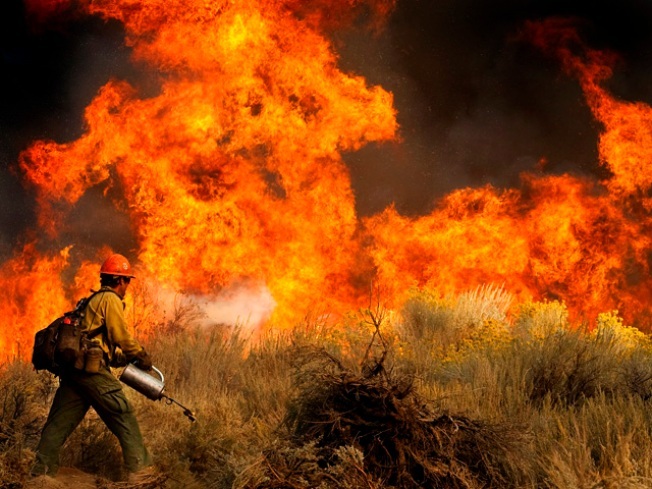 Daniel Fawcett of the U.S. Forest Service sets a back-fire to combat a wildfire in Wrightwood, California. Containment of the Sheep Fire grew to 75 percent Wednesday. Cooler temperatures allowed firefighters to gain ground on a wildfire burning near the mountain community of Wrightwood. More than 7,500 acres of prime forest land between Cajon Pass and the Mountain High Ski Resort burned over the weekend in the second major blaze to hit the mountain range on the north side of the Los Angeles urban area in five weeks. The Sheep Fire broke out around 2 p.m. Saturday not far west of Interstate 15 at the southern end of the Cajon Pass. The cause was not immediately determined. Wrightwood's 6,000 residents got mandatory evacuation orders at 10 a.m. Sunday, when the blaze came roaring up Lone Pine Canyon from the southeast. Wrightwood residents live in a steep, landslide-prone mountain bowl on a major earthquake fault and in the middle of fire country, and nearly all left when told to do so, according to the California Highway Patrol.